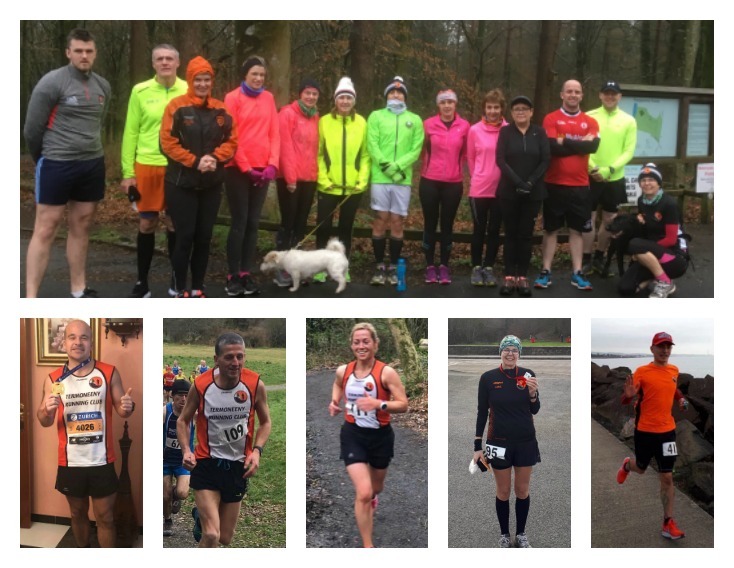 There were races aplenty this week and Termoneeny Running Club members travelled near and far to take part in events ranging from 5ks to ultra marathons. On Thursday Declan Leung completed a marathon which was organised by the East Antrim Marathon Series. He ran six full loops of a route that took him from Loughshore Park to Gideon’s Green. He finished it in a brilliant time of 3:59:04 and reported that the conditions were ideal for running. This was a fantastic performance from Declan and it provided great training for his upcoming ultra marathon. Jacqueline McGonigle participated in a challenging half marathon on Saturday morning in Folly Glen, Armagh. This was Jacqueline’s second half marathon race and it was part of the ‘Big Ronnie’s 100th Marathon’ event. Jacqueline ran 7.5 laps of an undulating trail course and the pleasant weather contributed to making it an enjoyable experience. Jacqueline displayed fantastic running once again and achieved a super result of 2:59:41. The final event of Sperrin Harriers’ Winter Series took place on Saturday morning in the form of a ten mile race at Parkanaur Forest. Orla Hatt and Thomas Doherty represented TRC and they strode with ease around the forest three times, past the stately Parkanaur House and along the Torrent River. It was a fantastic end to another brilliant league and appreciation is forwarded to Sperrin Harriers for their outstanding hospitality. It was a test of endurance for Fergal Hughes as he took on the ultimate challenge of an ultra marathon at the Last Man Standing Event in Castle Ward on Saturday. Fergal completed 19 laps of 4.2 miles every hour to finally accumulate a total of 79.8 miles. This is an incredible achievement for Fergal and truly is inspirational running. Christian Fortes O’Neill travelled to his birth country of Spain to take part in the Zurich Maratón de Sevilla. This was Christian’s 53rd marathon and he managed to accomplish his third personal best in a row at this event with a tremendous result of 3:33:14. It was certainly no small feat for Christian considering he ran in sweltering conditions of 22˚C. Well done to Christian on another terrific performance. On Sunday morning a group of TRC members and friends gathered at Portglenone Forest for a sociable run. Everyone ran at their own pace, covering different distances but enjoyed conversing afterwards with warm refreshments that were kindly organised by Susan Duggan. This will be a monthly fixture with members’ family and friends all welcome to attend. Congratulations to all the TRC members who represent the club so well throughout the country and further afield. If you are interested in joining Termoneeny RC please visit termoneenyrc.com or send us a message on facebook. ⇐ Termoneeny Continue to Stay the Course as Winter Bites! Termoneeny Continue to Stay the Course as Winter Bites! TRC Runners Defy Sub-Zero Temperatures! 2nd Marathon of the Year!